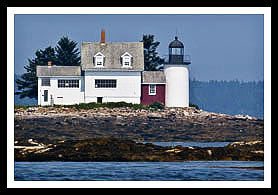 The lighthouse is located on Green Island, which is on the western side of Mount Desert Island. Privately owned. Green Island needed a lighthouse with the increasing lumber trade from Ellsworth and to guide mariners between Penobscot Bay and Blue Hill Bay. Blue Hill Bay lighthouse, sometimes referred to as Sand Island Light, was built in 1857 on this low-lying strip of land and added a rather fancy keeper’s quarters with an attached barn, a boathouse, outhouse, oil house, and a huge rain-collecting cistern for fresh water. Keeper Roscoe Chandler had two of his children, when they became young teenagers, attend his farm in nearby Monroe, and, would walk their cow from Monroe to the light station during low tide. They would stop at a local farm along the way and swap some of the cow’s milk for lodging and a meal. While tending to the lighthouse, Chandler developed a bad case of ulcers and required lots of fresh milk. Two cows were later purchased and brought to nearby Flye Island to provide milk for the keeper and his family. The cows could be walked between the two islands during low tide. Sometimes during thunderstorms, the bovines would go into the waters from Flye Island and swim towards the lighthouse station. Usually one of the family members had to go out in their boat to steer the animals back to the island to graze. There were no phones on the island in the 1920s, so when the keeper was needed on shore, a designated local from the mainland would hang a black suit or dress outside their home as a signal. The lighthouse was discontinued in 1933, and is a private residence. Today a solar powered skeletal tower operates nearby. Brooklin is a tiny remote village with one general store and great friendly people. 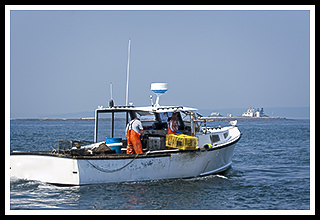 You can go to Naskeag Point dock and wait for the lobster boats to come in around mid-afternoon and purchase live lobsters right off their boats. You may even be able to catch a ride out to the lighthouse with one of these fine folk (I did). There is also a public (free) beach at the point to relax at. The lighthouse and grounds are not open to the public as it is privately owned, but the lighthouse can be viewed by boat. 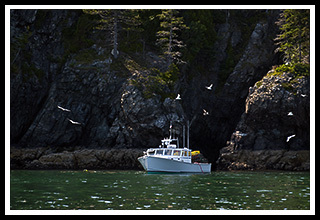 The Maine Environmental Research Institute offers an Eco-Cruise that passes by the lighthouse from Naskeag Point in Brooklin. This group provides lots of family tours to educate kids about marine life. This lighthouse can also be viewed by air from the Bar Harbor Airport. Acadia Air offers flights over the island. This is a quiet remote area and there is only one place to catch a boat to go directly to the lighthouse. From US Route 1 in Orland, take Route 15, to Route 172, then Route 175 towards the town of Brooklin. If you're heading north from Deer Ilse, pick up Route 175 to Brooklin. When you come upon the one general store in this tiny village, take the Naskeag Point Road south for two miles to the end, where you'll come to Naskeag Point. Boat cruises and windjammer sailing adventures may offer many types of cruises. 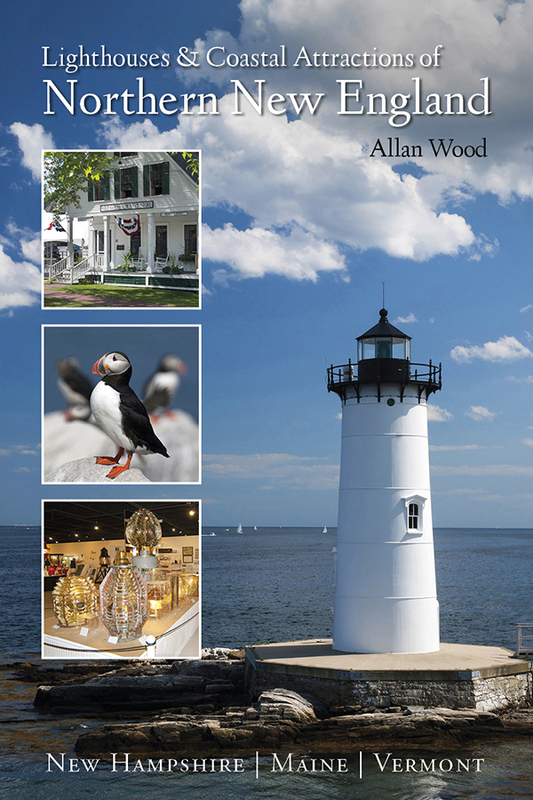 While some may offer specific lighthouse cruises, some may pass by Blue Hill Bay Lighthouse as part of sailing charters, narrated wildlife and historic tours, fishing tours and other types of excursions. Provides educational eco-excursions that pass by the island. Lighthouse tour includes Schoodic Peninsula, the community of Winter Harbor, the Cranberry Islands, Southwest Harbor, Bass Harbor and four area lighthouses.